We recently held our annual girls' football festival. A full morning of football fun for six local primary schools. This year pupils from primaries 6-7 were invited to Spartans Community Football Academy for our annual football festival. Over 160 pupils from Pirniehall, Wardie, Craigroyston, Ferryhill, Granton and Blackhall Primary Schools enjoyed a morning of football with us. The girls took part in fun drills and skills activities and small-sided games to introduce football and improve skills and confidence. We also had face painting and a smoothie bike which were both a great hit. Scotland squad players Micky Mcalonie and Abbi Grant came along to give us some motivation and inspire the pupils. 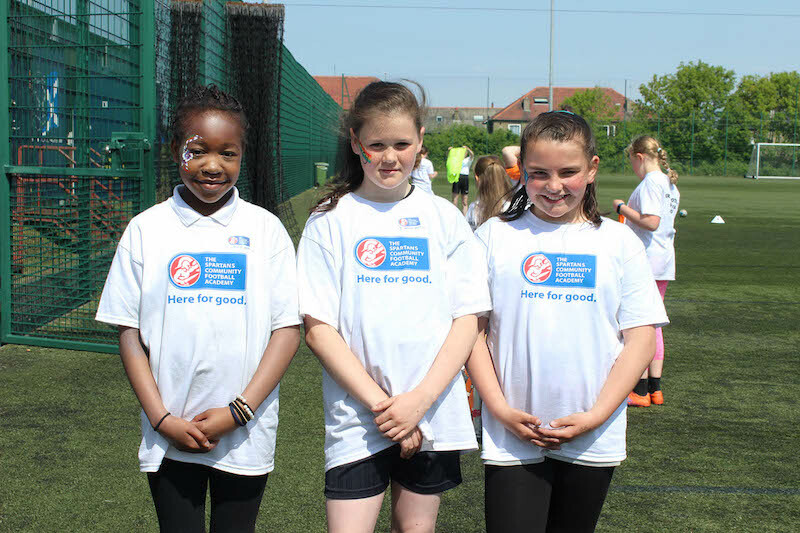 Michelle Ndlova from Craigroyston Primary School enjoyed the shooting practice and a chance to play in goals. Cerys Corey from Ferryhill Primary School through that playing mini games was the best thing about the morning and Alana Stoddart from Granton Primary School enjoyed meeting new people. This year pupils from the different schools formed mixed groups so that primary 7 pupils in transition could meet with new people. It was agreed by all staff that this was a great way for pupils to get to know each other before they enter S1 later this year. With the help of our sponsors Hanya Partners we were able to give each pupil a t-shirt and water bottle – both of which were very useful on a hot day! Morrisons Granton provided our half time healthy fruit snacks. We had great support from volunteers from Edinburgh University Women’s Association FC and Spartans Women’s FC. Young people from Wester Hailes Education Centre, Craigroyston Community High School School of Football and Trinity Academy also helped at the event giving them experience in running a large sports festival. This year we are worked in partnership with the Parikrma Humanity Foundation in India where young people were also holding a football festival. We will be encouraging pupils and schools to learn about each other’s cultures through a shared love of football.